Read about us on BBC Wales front page on 28 December 2015! As the year draws to an end and in the midst of this wonderful festive season it is time to reflect on our food consumption and the amount of edible food that may be wasted. What can you do to love your leftovers and to reduce your food waste? This Christmas weekend we have had fantastic time in our kitchen using our limited leftovers from Christmas dinner. They went such a long way making us two delicious pie dinners (one with turkey and one with ham), bubble & squeak with our roasted veg, whilst we had planned to use our organic cabbage in a pickled raw salad with seeds because it lasts well over a week! Yesteday we cleared through our cupboards making sure that everything is clearly labelled and this week we will be mainly eating what’s already there. Make a pledge to join us this year in our effort to help reduce waste, to take care of ourselves better through nutritional meals and to benefit our pockets. There is plenty of inspiration and help from us and Green City Events coming up with Love Food Hate Waste roadshows and cook ups scheduled most of the weekends of January and February 2016. To stay up to date with booking links and further information, follow us on twitter and facebook, and subscribe to our mailing list. This entry was posted in Comment, Events. The last 2014 Lia’s Kitchen pop-up dinner took place on the last full moon of the year . On Sunday afternoon I ‘sat’ tired amongst boxes and paperwork reflecting on the two pop up dinners we completed this weekend. What a success! Accounted for are a broken box (it happens), a broken gazebo (don’t ask), at least 30 to-S and fro-S between the shed , the living room and the car, hours of cooking , sorting , cleaning, thinking. And also one proud me and endless moments of contentment. 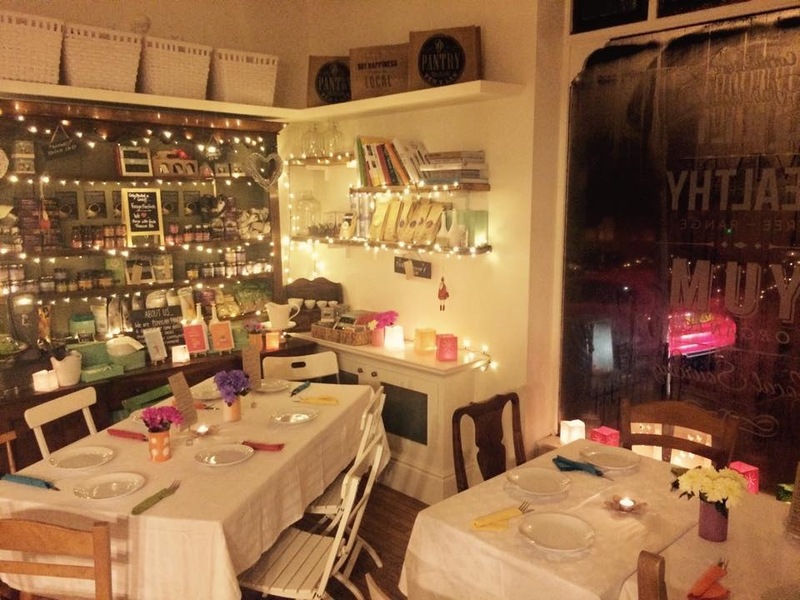 I begun and ended this year’s pop-up dinners at Penylan Pantry a deli/café that has livened up and brightened our area. I have thrown five pop up dinners since May 2014 all exploring foods, cultures and recipe combinations that I love. It’s been quite the journey, fulfilling and always full of surprises. The next immediate thing on the cards for me is slightly different in that it will involve educational waste awareness workshops to help people reduce their food waste. I will be working with two social venturers I respect a lot. I am very excited and proud I will be using my free time towards such a venture. As for the future…it holds surprises that I cannot predict but I am sure there will be congregations as beautiful and warm as those of the last two days. So watch this space ! Get in touch! Don’t be a stranger! Thanks to all who have joined our table and made these pop up dinners so wonderful. It’s the people who appreciate what’s offered to them and enjoy each other that create this wonderful atmosphere that seeps into our life and fuels Lia’s Kitchen. Thank you old and new friends who help make Lia’s Kitchen happen through your hard work -you know who you are. Happy birthday to the Penylan Pantry who is one today. Mel and Jo well done you are stars and thanks for hosting Lia’s Kitchen events. Photos by Jo, Penylan Pantry, Dean Doyle, Lia’s Kitchen and Dan Green.